We were invited by Sally Munday-Webb of Brackley Town Council to provide the music for their inaugural Georgian ball. This event, which we hope will become a regular fixture in the Boxwood and Brass calendar, was part of the very exciting plans to restore Brackley's beautiful Georgian Town Hall. The town has received a large grant over over £3m from the Heritage Lottery Fund and other funders and, as part of this project, there are many activities that engage local and national people with the project through education, participation and volunteering. We were joined by the most marvellous Dance Master - Stuart Marsden, and his dance partner Nicky Morrison. 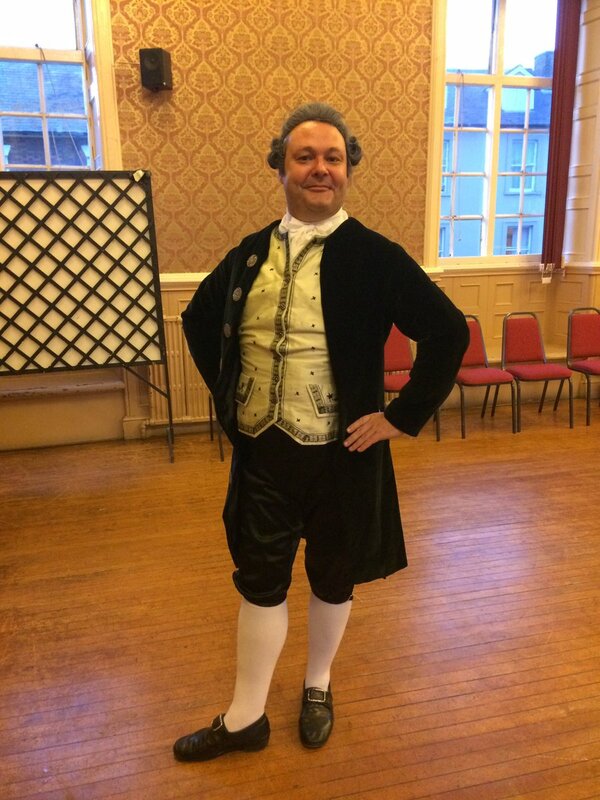 Stuart has quite a pedigree - he's an expert on social dancing of the 18th, 19th and early 20th centuries and has appeared and advised on many TV programmes including "Pride and Prejudice: Having a Ball" (2013) "Dancing Cheek to Cheek: An Intimate History of Dancing" (2014), and "Poldark" (2015). Dance Master Stuart Marsden with Lucy Worsley in the BBC series "Dancing Cheek to Cheek -An Intimate History of Dancing"
Prior to the ball Stuart had liaised with Boxwood and Brass to create a special selection of Georgian dances for this event. The evening started with Boxwood and Brass serenading the local community attending the event and then Stuart and Nicky performed a Minuet as a demonstration dance. This was followed by Stuart teaching the assembled throng various "country dances", cotillon and allemands accompanied by Boxwood and Brass. Stuart had brought with him some of the sources he uses when studying historic dance. We were glad to have his expert knowledge as to the non-expert eye some of these sources are quite hard to decipher. After a short break the evening continued with a short concert by Boxwood and Brass in which we explained a bit more about our instruments and the music followed by more dancing! Finally - here's a little snippet of part of our rehearsal!